Sociocultural Anthropology, economic anthropology, anthropology of money and finance, philosophical anthropology, hope and futurity, gifts and exchange, art and material culture, citizen and city diplomacy, the Pacific Islands (mainly, Fiji), Japan and the U.S.
Hirokazu Miyazaki was born in Tokyo and was originally trained in anthropology in Japan and at the Australian National University, where he earned a Ph.D. as a specialist of Fiji and the Pacific Islands. Miyazaki subsequently contributed to the formation of the interdisciplinary field of the social studies of finance. His current research focuses on the history of citizen diplomacy for peace and the world without nuclear weapons. In February 2018, Miyazaki was appointed by the Mayor of Nagasaki as a Peace Correspondent for Nagasaki. Before joining the NU Department of Anthropology as the Kay Davis Professor, Miyazaki taught anthropology at Cornell University for sixteen years. 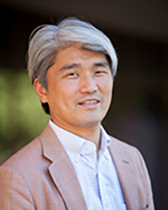 From July 2015-June 2018, Miyazaki served as the Director of the Mario Einaudi Center for International Studies and the John S. Knight Professor of International Studies at Cornell. Miyazaki’s research has long been driven by a very simple question: how do we keep hope alive? Miyazaki has investigated the question ethnographically in several different field sites: Suva, Fiji, Tokyo, Nagasaki and Rochester, N.Y.
Miyazaki’s first fieldwork project (1994-1996) focused on Suvavou people, descendants of the original landowners of Suva, Fiji's capital. His first book, The Method of Hope: Anthropology, Philosophy, and Fijian Knowledge (Stanford University Press, 2004), is a study of Suvavou people's long-standing hope to regain their ancestral land. In that book, drawing on extensive archival and field research, Miyazaki examines how Suvavou people have kept hope alive over the last hundred years. His analysis draws attention to the capacity of Suvavou people to create hopeful moments across different facets of their life ranging from petitions to the government to gift-giving rituals, Christian church services and business activities. The book is also a critical assessment of well-known philosophical texts on hope such as the German Marxist thinker Ernst Bloch's book, The Principle of Hope, and represents an effort to carve out a space for a new kind of anthropological engagement with philosophy. Miyazaki’s second fieldwork project (1998-2013) focused on a team of Japanese derivatives traders at a major Japanese securities firm. The focus of this project was on these traders' career changes in the midst of Japan's economic slump. In his second book entitled Arbitraging Japan: Dreams of Capitalism at the End of Finance, Miyazaki examines these traders' hopeful (and sometimes utopian) visions animating their daily trading and life decisions. In particular, he investigates how these traders have sought to extend economic assumptions such as the efficient market hypothesis, trading strategies such as arbitrage and tools of trade such as the Excel spread sheet program to facets of life beyond the market narrowly defined. The aim of this investigation is to explore the extent to which theories and techniques of finance have served these Japanese traders as an intellectual resource for developing critiques of capitalism and expanded visions of humanity. Underlying this project is a view of traders and other financial market experts as thinking subjects engaged in dialogue with various intellectual traditions. Miyazaki’s third ethnographic project (2017- ) focuses on the history of citizen diplomacy and inter-municipal cooperation for peace in Japan and the U.S. Miyazaki is currently completing a book about the U.S.-Japan friendship doll exchange of 1927 and its contemporary permutations (https://www.japantimes.co.jp/opinion/2017/02/08/commentary/japan-commentary/lessons-can-learn-exchange-dolls/, https://www.democratandchronicle.com/story/opinion/guest-column/2017/09/29/essay-japanese-doll-exchanges-offer-lessons-peace-understanding/716920001/). The book is based on his ongoing ethnographic and archival research in Nagasaki and Rochester, N.Y. In all of these projects, Miyazaki’s ultimate goal has been to construct an ethnographically informed theory of hope that is also hopeful. Forthcoming. Nichibei ningyo koryu no saikento: Ningyo, kokan, kodomo (Re-examining the U.S.-Japan doll exchange of 1927: Dolls, exchange, children). Co-edited with Hiroaki Koresawa and Jun Inoue. Yokohama: Seori-shobo. 2017 The Economy of Hope. Co-edited with Richard Swedberg. Philadelphia: University of Pennsylvania Press). 2017 “The Economy of Hope: An Introduction.” In The Economy of Hope. Co-edited with Richard Swedberg. Pp. 1-36. Philadelphia: University of Pennsylvania Press. 2017 “Obama’s Hope: An Economy of Belief and Substance.” In The Economy of Hope. Co-edited with Richard Swedberg. Pp. 172-189. Philadelphia: University of Pennsylvania Press. 2016 “Hope in the Crack of the Social: Reading the Book of Job in Post-Fukushima Japan.” In Hope. Ingolf U. Dalferth and Marlene A. Block, eds. Tübingen, Germany: Mohr Siebeck.